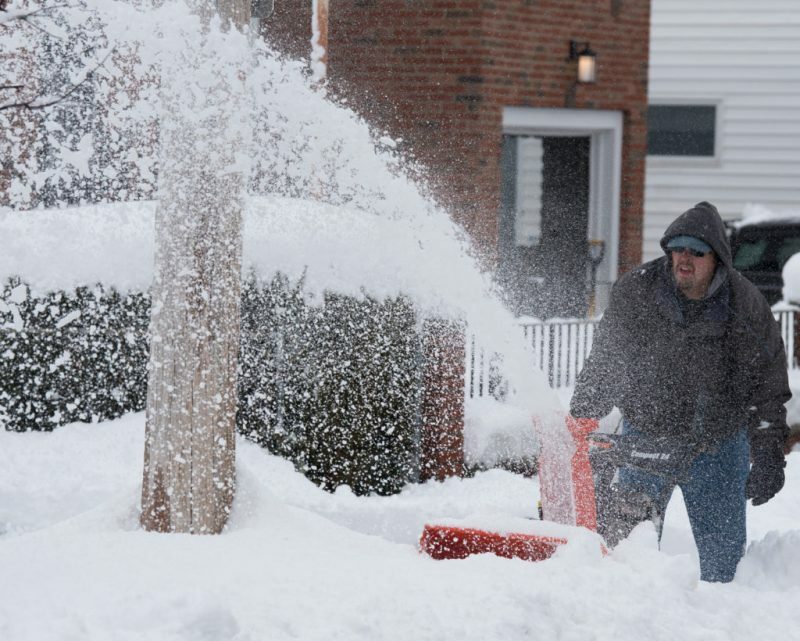 Bob Doherty used his snow blower to clear the sidewalks in front of his Chelsea home on Monday morning. A late winter storm dumped between 10 and 11 inches of snow on Chelsea Sunday night – leaving a winter wonderland for residents to wake up to on Monday. As Melissa Perez has watched the Encore Boston Harbor casino get taller and taller, she never dreamed she might work there one day. On Monday, Perez, 26, stood with a smile from ear to ear at the Encore Job Fair in the Hynes Convention Center, reveling in the good news that she likely would be hired as a pastry chef. Perez was one of thousands of potential employees, particularly from Everett, Charlestown, Chelsea and Malden, that flooded the Hynes Convention Center in the Back Bay last Sunday and Monday looking for possible employment at the casino – which is offering some 5,000 jobs in 500 different categories, and they’re jobs that need to be filled and ready by the June 23 opening date. Perez’s enthusiasm was shared by many, and Encore President Bob DeSalvio said that the long-promised job opportunities have now become reality. DeSalvio said they had concerns of whether they could find the right people in the right numbers, but he said after this first fair, he no longer is so concerned. Many of the people they interviewed, he said, were already employed. Like Perez, DeSalvio said applicants from the Everett and Chelsea communities were interested in being closer to home. DeSalvio said they interviewed for nearly every position, from hotel workers to food and beverage workers to banquet supervisors to finance positions. In the area of finance, DeSalvio said he was surprised by the vast numbers of folks looking for an opportunity with Encore. “We had an exceptional turnout for accountants (and finance),” he said, noting that they had many from the banking industry show up for their openings. He said they were also just looking for talented people – even if they weren’t right for the job they wanted, DeSalvio said they wouldn’t let them slip away. The job fair was the first of three that are planned for the Hynes, and the usual Encore energy was transferred to the Back Bay facility from the first step inside. Applicants were greeted at the front lobby of the main hall to check in or register if they were walk-ins. If one did not have a resume printed or created, there were places on hand to get that done before going inside. Once inside, pulsating music sounded from a live DJ in one of the back waiting rooms, while candidates registered and got their number for the initial interview. After that process, they progressed to a waiting room with comfortable couches, the live DJ, a dance floor and fresh flowers. It was there they waited for their specific job interviews – with the DJ calling their number over the music when it was time for them to interview. Encore didn’t hire any special company to do the interviews, but rather they had all hands on deck, with current employees – including DeSalvio – handling the interview processes. Current employees from food and beverage interviewed prospective candidates from those areas. If all went well, candidates could leave with a good assurance that they would be hired – though no jobs were given on site. DeSalvio said they already have 400 employees on board, and they have another 1,100 that are already in the queue. He also added they have been very pleased with the success of the dealer school at Cambridge College in Charlestown. They have about 150 that have graduated and the next session is full already. From the point of hiring, those who are “onboarded” will have a series of licenses from the state or qualifications to get through. Once that is done, they will begin reporting for their jobs in late May and early June – with some of the culinary positions starting in late April. DeSalvio said they will go through extensive on-site training because things have to be perfect when they open. While there will always be mistakes, at the five-star level, a resort has to be top quality on day one. Encore plans to have another large hiring event at the Hynes Convention Center in mid-March. City Manager Thomas Ambrosino got a new five-year contract and a healthy serving of praise from the City Council Monday night. The council approved the contract with a 10-0 vote. Councilor-at-Large Roy Avellaneda was not present at Monday night’s meeting. Ambrosino gets a three percent raise with the new deal, from $184,913 annually to $189,945. Council President Damali Vidot said a sub-committee made up of Councilors Luis Tejada, Giovanni Recupero and Yamir Rodriguez had been evaluating Ambrosino for several months, and agreed that he has done a good job and should be invited back. Vidot said the evaluation showed councilors and the public felt he was a little too hands-off on his management of departments, and wanted to see him be a little more hands-on with them. For Vidot, she said one of his strengths has been treating the City Council with great respect. On Monday night, the praises continued at the Council meeting before they voted to extend the contract five more years. Several councilors commented on Ambrosino’s responsiveness to residents’ concerns. “Whenever I have had a problem in my district and brought it to his attention, the city manager has been very responsive,” said District 1 Councilor Robert Bishop. District 5 Councilor Judith Garcia said Ambrosino has been an incredible asset and resource for the community. “He has invested a lot in the community, and I hear it from my constituents a lot,” said Garcia. In addition to the three percent pay raise, Ambrosino will get an additional $500 per year for travel, and the former Revere mayor’s new contract will be for five years, compared to his current four-year contract. Ambrosino has said since last fall he would like to be asked to return to Chelsea for another contract term. He said he feels like he has more work to do in the city, particularly with his downtown initiatives. A resolution passed by the City Council Monday night recognized February as Black History Month and thanked the Lewis H. Latimer Society, Bunker Hill Community College, and the Chelsea Black Community “Remembering Black Migration, WWI, and the Chelsea Fire” for the contributions to the city. The Council also recognized Feb. 21 as Dr. Maya Angelou Day in Chelsea. •The council requested a meeting with Emergency Management Director Keith Vetreno to discuss 911 services. •Councilor-at-Large Leo Robinson requested that City Manager Tom Ambrosino update the council on all planned development in the city. •District 6 Councilor Giovanni Recupero requested a brighter streetlight on Charles Street, as well as a study for traffic on the Meridian Street Bridge. The brightness of the new LED streetlights has been a problem point for several years, as most of them are on the lowest setting to save money on power. Recupero has routinely asked the City to increase the brightness on the new LED lights. When Chelsea residents go shopping for the holidays next year, they will have to either bring their own bags or pay a dime for a heavy-duty plastic bag. Monday night, the City Council approved an anticipated single-use plastic bag ban in the city. The ban goes into effect one year from the Dec. 17 vote. The proposal has been discussed in committee and meetings on the ban have been held with local businesses, but the issue was not listed on Monday night’s agenda. District 4 Councillor Enio Lopez made the motion to take the ban out of conference committee and have it voted on by the full Council. Lopez noted that single-use plastic bags are bad for the environment and are also a constant source of litter around the city. District 1 Councillor Robert Bishop said he initially had some mixed feelings about the proposed ban, but said he was swayed by Sunday night’s ‘60 Minutes’ segment on the environmental dangers of plastic. “I think plastic will kill us all if we keep going the way we are going,” said Bishop. While Bishop said plastic bags are just the tip of the iceberg when it comes to the dangers of plastic, banning plastic bags is a start. District 3 Councillor Joe Perlatonda voted for the ban, but said he did have some concerns about the cost to consumers and businesses. While single-use plastic bags will be banned, consumers will be able to purchase sturdier, multi-use plastic bags for 10 cents. Councillor-At-Large Leo Robinson shared some of Perlatonda’s concerns and recommended the proposal be kept in committee, giving local businesses more time for input. But the majority of the Council favored taking action Monday night. “There have been other cities that have implemented this, and you can see a huge difference in the streets,” said District 2 Councillor Luis Tejada. The one year time-frame before the ban goes into effect will give the City time to do outreach to local businesses, and give the businesses time to go through any existing stock of plastic bags. The ban passed with a 10-1 vote, with District 8 Councillor Calvin Brown casting the lone vote against it. After more than two and a half years of negotiations, the City is on the verge of a new contract with its two police unions that will see pay increases of up to three percent and implement residency requirements for new hires. Monday night, City Manager Thomas Ambrosino requested the City Council approve the contracts, which are retroactive to Fiscal year 2017. The Council forwarded the request to its subcommittee on conference, and will take up an official vote on the contracts at a future meeting. The collective bargaining agreements are for the unions which represent police superior officers and patrol officers. “Both deals encompass four years, made up of two separate contracts: a one year deal for FY17; and a subsequent three year deal for FY 19-FY20,” Ambrosino stated in a letter to the City Council. The contracts include a retroactive salary increase of 2.5 percent for FY17 and 3 percent for FY18 and FY19. There is also a 3 percent increase slated for FY20 and an additional 1 percent increase that goes into effect on Jan. 1, 2020. All told, the retroactive salary increases total about $876,000. The salary hikes are the only cost item in the new contracts, according to the City Manager. Other items in the contracts related to longevity, detail pay, sick leave incentive, and clothing allowance are limited to clarifications or minor changes and do not add any additional costs to the City, he added. The percentage increases for salary are slightly more than those other City Hall unions have received, Ambrosino said. While there was no debate over the union contracts themselves at Monday’s Council meeting, District 1 Councillor Robert Bishop did raise concerns about the City’s use of its stabilization, or “rainy day” funds. Bishop noted that Ambrosino was requesting the use of stabilization funds for improvements to Eden Park and for a protective cover for the new high school turf field as well as for the contract salary costs. Those stabilization funds should be used for emergency situations, Bishop said. “I don’t think any of these requests rise to the level of an emergency to use the rainy day fund,” he said. While Bishop said he supported the requests being made, he wanted assurances that any money taken out of the City’s stabilization funds be replaced by free cash as soon as those funds are certified by the state. The Chelsea High School Class of 2019’s quest to graduate outside at the high school could come to a conclusion at the City Council’s next meeting on Monday, Dec. 17. That’s when the Council is expected to vote on a $170,000 appropriation from the school stabilization account to pay for a protective mat for the new turf field at the high school. City Manager Thomas Ambrosino made the request for the funds for the protective mat, which he said will allow for the use of the turf field for non-sporting events. The turf field comes with an eight-year warranty, but that warranty is voided if there are certain non-sporting uses on the field. The possible purchase is good news for members of the high school’s senior class, who have been working with school and city officials, as well as fundraising, in an effort to have their graduation moved to the high school field. Senior Manuel Teshe said the turf field cover will benefit the whole city, as well as students and their families attending the graduation. Senior Class President Jocelyn Poste was one of a number of CHS students wearing “Dream Big” shirts who addressed the Council on Monday night. School Supt. Mary Bourque also lent the students some support before the Council. “This is a wise investment for our future and will have a positive impact on every generation here,” Bourque said. District 5 Councillor Judith Garcia urged all the students present on Monday night to return with their friends on Dec. 17. “I’m so incredibly proud of everything that was said tonight,” she said. In other business, the Council approved a change in the zoning ordinance requiring tighter building controls in the Admiral’s Hill neighborhood. Councillor-At-Large Roy Avellaneda introduced an order requesting that the License Commission hold two recreational marijuana licenses for applicants that have a majority ownership consisting of Chelsea residents. Ambrosino asked the Council to approve funding for renovations to Eden Park. The majority of the renovations will be reimbursed through a state grant, the city manager stated. “The proposed renovations of Eden Park include replacement of the playground’s rubber surfacing, introduction of new playground equipment, installation of a new water feature and splash pad, installation of new site furniture and lighting, and reconstruction of all site utilities,” Ambrosino stated in a letter to the Council. The total cost of the renovations is about $750,000, according to Ambrosino. The City Council appropriated $250,000 through the Fiscal Year 2019 Capital Improvement Program. Of the remaining $500,000, the City Manager said $400,000 should be reimbursed by the state. The Chelsea Walk – for those on the right side of the law – has been a place to run from. Now, City officials, a local artist and GreenRoots are hoping to make those kind folks find a reason to stay in the Walk. After raising more than $58,000 and getting a MassDevelopment matching grant, GreenRoots and the City have now embarked on a public process to begin revamping the Walk – a long-troubled small stretch of walkway between the Cherry Street parking lot and the Broadway business district. On Monday, the collaborators held a public visioning session on the Walk, complete with Chelsea artist Sylvia Lopez Chavez – who has been selected to design and carry out the sprucing up of the place. Roseann Bongiovanni, director of GreenRoots, said the Walk was targeted as a place that could become very important to the downtown. “We’re looking at murals, lighting, furniture and art installations on the roof fixtures to make it feel more friendly, inviting, safe and comfortable,” she said. She said Monday was the first of two visioning exercises with the public, and then it will be full steam ahead. A community paint day led by Lopez Chavez is scheduled for Aug. 3 and 4 between 11 a.m. and 4 p.m. each day. Much of the changes are expected to be done in about one month, and the final result could be programming that includes game nights and more seating. Chavez said she is very excited to get to paint a mural and refurbish something in her own community. A veteran of mural and public art work in Boston, she is now focused on what kinds of creative things can be put into the Walk. Additionally, she is working with members of the community to think about what should be decorating the top rafters of the walk. There is talk about things hanging from it, perhaps lights, and maybe even colored plexiglass to make the look very unique. Bottom line, she said, is to create a space where people feel comfortable and want to stay for a bit. That won’t be entirely easy to come by, as reclaiming the space from the criminal element and the bar crowd from the pub next door will take work. Even during Monday’s event, there were some incidents that had to be ironed out. Councilor Enio Lopez said he is glad to see it recovered. The question: What are we going to do about Trump? 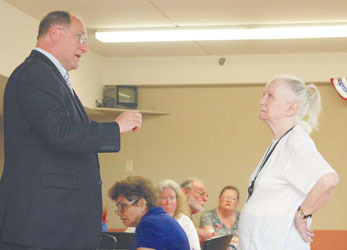 The answer came from Congressman Michael Capuano to Anchors Weigh resident Carole Oles during a campaign stop for the Somerville-born congressman. Capuano and several supporters from Chelsea sponsored the event Monday night, July 2. In a world where every threat to a school has to be taken seriously, that played out on Monday morning at Chelsea High when the schools were put on alert by a social media threat to “CHS” that turned out to be a month old and referring to a school in New Mexico. Bourque said it was unfortunate, but it was something that’s going to happen more often. The high school was functioning normally shortly after the threat was investigated. The Chelsea City Council voted 9-1 on Monday night to call for City Solicitor Cheryl Fisher Watson to draw up a new ordinance requiring a five-year residency period for all new police and fire hires. The controversial move was brought for the umpteenth time by Councillor Giovanni Recupero at Monday’s Council meeting, and it had been highly anticipated by the membership for several weeks. Recupero’s plan calls for any new hire of the Police Department or Fire Department to live within the city for five years after being hired. Currently, there are no such restrictions, but Recupero has been on a mission for more than five years to get something drafted and passed. His order on Monday simply called for the Solicitor to draft up an ordinance and have it ready for Council consideration by the next meeting. Many had been interested to see what new Councillor Bob Bishop might think of the matter, as it was the first time it had been before him. And he made himself quite clear that he supports residency. Councillor Roy Avellaneda was the lone lawmaker against the measure this time, and said he thinks the Council should focus on other things. “I’d rather focus my energy on making Chelsea a better place to live than a place to be forced to live,” he said. Councillor Judith Garcia didn’t vote on the matter as she was absent. Fisher Watson said there are concerns that any such ordinance would conflict with collective bargaining agreements, so she wasn’t sure she would be able to produce the new ordinance. Recupero said that any such conflict does not exist and the ordinance can be written up and considered. He said after the Council passes the ordinance, it’s up to the City Manager to negotiate the collective bargaining to include the new requirement for new hires. The Chelsea Rev. 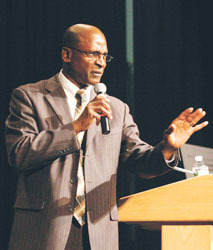 Dr. Martin Luther King Jr. celebration was commemorated in song, in speech and in camaraderie on Monday, Jan. 15, at Chelsea High School.Keynote Speaker Rev. Basil Yarde related how King inspired him as a young man. The annual event also saw performances from Chelsea High students, student essay contest winners and community spirit award winners.